Northwest Flower and Garden Show in Seattle…a few good books…. Hard to believe that the Northwest Flower and Garden Show in Seattle is 29 years old this year! If you have gardened in the South Sound any part of the 29 years, you will no doubt think about February as Northwest Flower and Garden Show month. It runs at the Washington State Convention Center February 7-11. 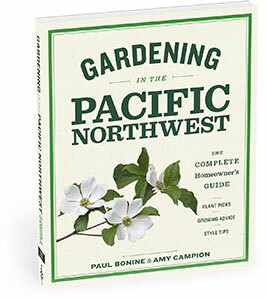 You can never have too many books about PNW gardening. Things change and you can always find something new. This newest one is all ornamentals and geared toward both sides of the mountains. Newer PNW gardening books have newer climate information. Bonine and Campion will speak together. “Pint Sized Plants for Pacific Northwest Gardens” Thursday, 11:15, Hood Room; “Great Plants Adapted to Pacific Northwest Climates” Friday, 11:45, Rainier Room. Sometimes renovating a garden is more challenging than starting from scratch. It’s hard to focus on what you can change and how you can get the most out of those changes. 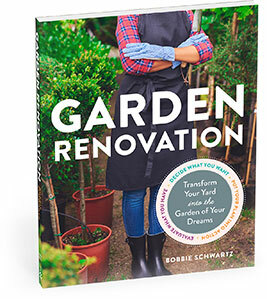 Bobbie Schwarz has been designing and redesigning gardens for 45 years and “Garden Renovation” is loaded with directions, ideas and examples. Who doesn’t like before and after pictures? She speaks about “A Happy Marriage: Design Integration of House and Landscape”, Wednesday, 1:45, Hood Room; “The Artful Garden Through Creative Garden Design”, Thursday,1 p.m., Rainier Room. Just imagine…not too long ago the only time you saw succulents were “hens and chicks” casually thrown up against rock walls. Now with so many colors and forms they merit design. 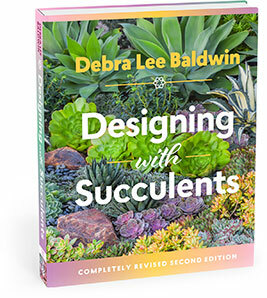 Baldwin is queen of the succulent craze and has written several books about succulents. “Sensational Easy-Care Succulents in Containers” is Baldwin’s focus on Wednesday, 11:15, Hood Room: “Designing with Succulents in the Pacific Northwest”, Thursday, 12:30, Hood Room. 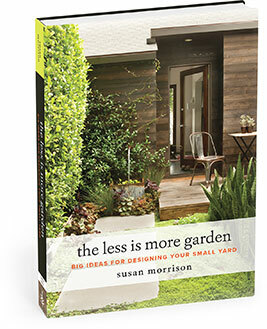 Small gardens can be “cram-scaped”…just too much stuff. Morrison’s garden philosophy is how to get more out of your garden space with less effort…not low maintenance as much as high enjoyment…streamlined. She speaks about “Less is More” Thursday, 2:15, Rainier Room: Saturday, 3:00, Hood Room. Or…everything you ever wanted to know about bees but didn’t know what to ask. You would think that a subject with so much science attached would be dry, dry, dry. Not so! It is a very readable description (with loads of pictures) about all different bee species, native bees in particular and what we can do to protect the pollinators.